Joseph Joseph worked with Design Wright to develop the Dual™ range. 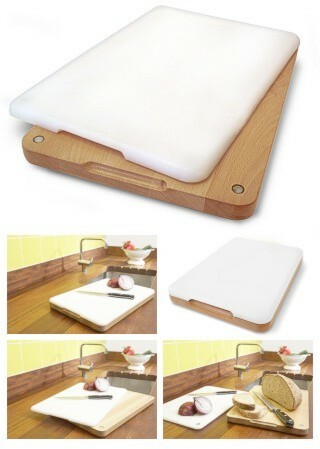 This innovative design uses the latest in polypropylene materials in conjunction with a beech wood surface giving you two separate chopping boards in one. They conveniently combine with the use of 4 magnets to reduce storage space by clipping together. All four surfaces are fully useable, from rolling pastry to chopping onions. The boards both measure 28 ½ by 19 ½ cm (approx. 11 ¼ by 7 ¾ inches). Available in small and large in Baby Blue, Sage Green and Bright White.